Saturday was the Head of the Hudson Regatta, hosted by our program. Since I only recently joined the program, I had the luxury of saying, "Put me to work!" and getting the straightforward job of Assistant Dock Master. We only had one really crazy moment, which was when all 16 junior (= high school) boys racing in the single all wanted to launch at the exact same time, and it was about 10 minutes before they were actually supposed to launch. We got them out but that was a logjam on the dock and apparently they all logjammed the starting chute, too, because many of them are still learning what they're doing. Fun times. I got to duck out and then race in a Women's Masters 4x. As with many regattas, we didn't have all that much competition, just one other quad from our program and a third quad from some other program whose name escapes me right now. So we won, yay! We even got a tiny trophy - a wooden clog, painted orange, in recognition of Albany's Dutch heritage. Also, it was a great row. Ages in the boat ranged from late 20's to mid-60's. 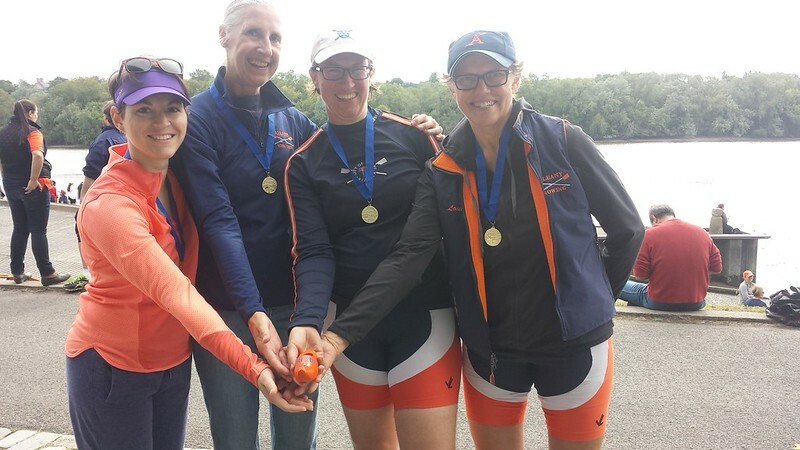 Masters rowing. On Sunday, scrottie, who has been itching and itching to get in some sailing, drove us downriver to the city of Hudson to check out an open sailing event organized by the Hudson Sloop Club. As these things tend to go, we didn't have all that much wind, but it was still great to get out on a new-to-us stretch of the river and also to talk to other avid boaters about all things boating on the river. Plus I deeply appreciate their vision, as a fellow boater who appreciates good, historic waterways. That expedition had me thinking: it's kind of amazing to have Princess TinyHouse here as our family vehicle. It's not the sort of motor vehicle that a person would be inclined to jump in to run a quick errand to the grocery store, but it was adequately convenient for getting down to Hudson, and it could be great for hiking and camping. And now, back to work. Students have their first exam today. I'm nervous for them. This entry was originally posted at https://rebeccmeister.dreamwidth.org/1252504.html. Please comment there using OpenID.